Arne took to driving really well through the countryside. I was in charge of navigation. Thankfully, we had our GPS loaded with the Italy app, and a British speaking female voice would let us know when we should "Turn in 300 meters" or if we missed a turn. We passed through lovely scenes like this. I tried to take photos through the window, while navigating, and Arne concentrated on driving. Which kind of drove him crazy that I did both. Our trusty rental car (below) made it all the way to Pienza, and there we had to use a pay phone to call Isabella and let her know we had arrived in town. That was a comedy of sorts trying to figure out where to park, without getting a ticket, and then trying to work the phone. As we had no working cell phone, this was our only option in notifying her. She had Carlo meet us at Cretaiole. This is Cretaiole, the lovely farm stay which would be our home for a week. My sister had stayed here last year with her husband. I had been looking forward with anticipation to this visit for a long time! It is just as beautiful in person as it looks in the photos. On a sunny day, even prettier. We had the off and on overcast, rainy weather throughout the week. They were delighted that rain had come for the olives and the wine needed it badly and they hadn't had rain since May. Meanwhile, while we were getting rained on in Italy, Seattle had 48 days straight of no rain! Common courtyard where people can meet to eat outside. Steps leading up to upper apartments. Ours is the doorway you see here in the picture below. Our room : Il Granaio, the old "grain" room. Inside our lovely apartment. Here is the dining area. A complimentary fruit bowl, and goodie basket, and house wine, olive oil awaited us. The hearth of the fireplace. Looking from bath, towards living area. Complimentary onion, garlic and lemon. Also, guests may pick produce from the garden as well. Each apartment is equipped with the Italian coffee making moka pot. It is fun to use! I am excited we have arrived! This is our view over the Val D'Orcia region, and across the valley is a view of the town of Pienza up on the hill. We got settled in and met a few of our neighbors in the farmhouse, Isa came and greeted us. Then we went back to Pienza, and shopped at the Co-op since their hours include a siesta for closure. We got Burre (butter), more Latte (milk),mozarella (fresh with an olive in the bag), and crackers.I picked fresh tomatoes and basil from the garden. We prepped the moka pot for coffee in the morning. Scoop out the coffee, put in the basket over the water-filled base, then you boil it until it percolates up to the top section and stops hissing. Voila! We had a shower and got ready for our trip back to Pienza (the 3rd trip of the day!) We were able to park at the San Gregorio farm house in Pienza, so we did not have to find parking in town each time we went in to Pienza. We had Isa make reservations for us at Trattoria de La Luna in Pienza. I had suckling pig, roasted. And Arne had rabbit in white wine sauce with white beans. We ate panna cotta with caramel sauce for dessert and had a double espresson macchiato to try to stay awake! We knew that Luciano would be coming by at night to visit and we didn't want to miss it! 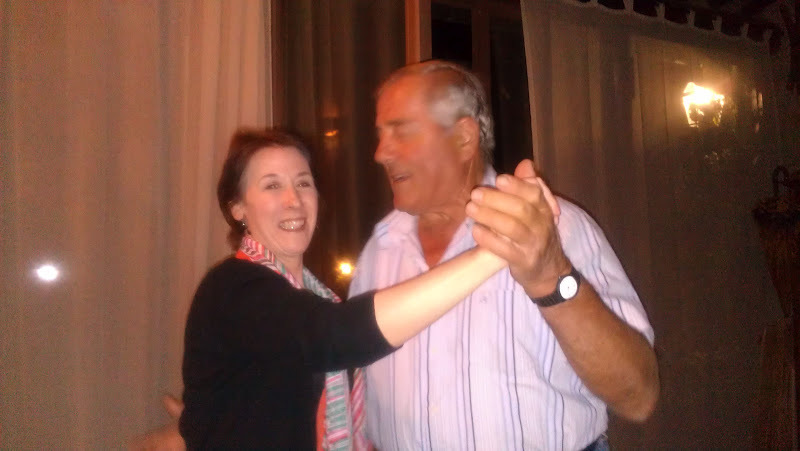 He was celebrating his 72nd Birthday and we sure didn't want to miss seeing him our first night. We met Flay and Alice, who would become good friends throughout our week. Part 2, Pergola of Death! 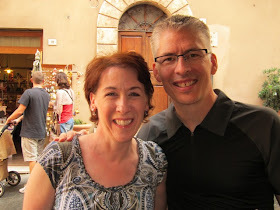 Welcome to my little blog that gives the essence of our amazing trip to Italy that we took in celebration of our 29th anniversary and my 50th Birthday. I hope you enjoy some of the sights and sounds of the vistas, people, food and music that we experienced along the way. We experienced the city, the country, the hilltowns, and the seaside. It was a trip of a lifetime! Ciao!